January 22, 2014, Albuquerque, NM: John Uczekaj, president and CEO of Aspen Avionics was inducted into the Living Legends of Aviation at its annual gala on at the Beverly Hilton. 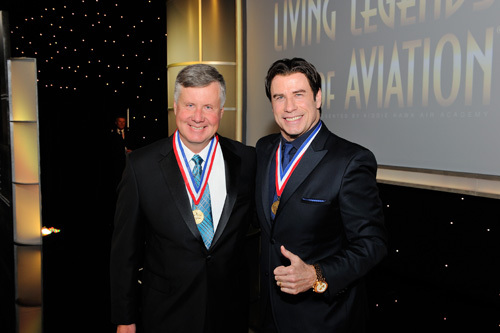 Among a star-studded audience, Uczekaj accepted his award from John Travolta, an advocate and supporter of general and business aviation. He was one among seven inductees at this year’s event produced by the Kiddie Hawk Air Academy. Leading Aspen Avionics’ growth for the past seven years, John is recognized for his leadership and impact upon the aviation industry. He has guided Aspen Avionics from a startup operation in 2006 to an industry and technology innovator with a pioneering spirit and vision. Uczekaj serves the industry in many roles, including board member for the General Aviation Manufacturers Association as Chairman for the Flight Operations Policy Committee. He is also a member of the Strategic Outlook Committee of the Aircraft Electronics Association (AEA), board member of the New Mexico Aviation Aerospace Association and a member of the Academy of Distinguished Engineers of the College of Engineering at Oregon State University. He is also an active instrument rated private pilot and owns and flies a Diamond DA40. Aspen Avionics specializes in bringing the most advanced technology and capability from the commercial and business aviation markets into general aviation cockpits—and budgets. Our products increase situational awareness and reduce pilot workload, making it easier and safer to fly in both VFR and IFR conditions. The way we look at it, getting the latest avionics technology shouldn't always mean spending a lot of money—on equipment or installation. At Aspen Avionics, we design products to be affordable, easy to install, and easy to own. The company can be found online at www.aspenavionics.com, and may be reached at (505) 856-5034. Click here to download high resolution image.